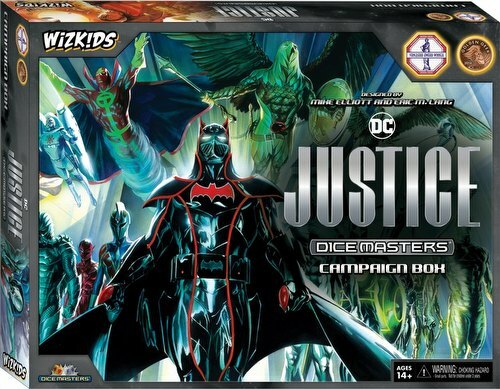 The DC Comics Dice Masters: Justice Campaign Box features iconic characters from the Justice League and Legion of Doom like Superman, Wonder Woman, Metallo, Lex Luthor, and more! With multiple versions of each, select the one that fits your team the best! Players can pit the Justice League against the Legion of Doom or mix them together. This release is perfect for new and seasoned gamers alike. Even if you haven't read Justice, this is an exciting entry point to an awesome spin on the Justice League with breathtaking art. Featuring more than a fifteen characters (and their dice! ), the DC Comics Dice Masters: Justice Campaign Box will be sure to deliver a page turning experience! Whats a Campaign Box? A Campaign Box is fixed content in a large box, and has everything 2 players need to start playing Dice Masters like Sidekick dice, Basic Action Dice, rules, and dice bags.